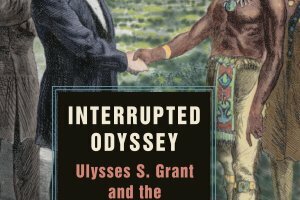 Contrary to previous works on President Grant, Mary Stockwell’s Interrupted Odyssey: Ulysses S. Grant and the American Indians argues that Grant had no intention of appointing missionaries to run the nation’s many reservations. Instead, he developed plans, with the help of his friend and first commissioner of Indian affairs, Ely S. Parker, himself a Seneca Indian, to place the executive branch and the army in charge of the Indian service. He was determined to protect the tribes from the onrush of settlers and to make every Indian and American citizen. Opposition to his approach arose swiftly from Congress, the Board of Indian Commissioners, reformers, the press, and the tribes themselves. In the end, Grant’s dreams for America’s “first occupants” failed in all respects but two: the tribes were saved, not exterminated, and the Indians finally became citizens of the United States in the 20th century. Our presenter Mary Stockwell received her Ph.D. in American history from the University of Toledo, served as a professor of history and department chair at Lourdes University, and is currently a fulltime writer.